Swiss Chard is a colorful leafy vegetable that’s as beautiful as it is nutritional. It’s broad leaves are vary from green to red, the stalks can be yellow, orange, red or even white. It’s a very popular vegetable throughout the Mediterranean, it can used raw in salads or cooked various ways. A classic combination is to cook it with Romano beans. It can served as a vegetable side or mixed with either rice or pasta. 1. In a large dutch oven or pot heat up 3-4 tbsp of olive oil and fry the pancetta pieces. 2. Once the pancetta pieces brown, add the onions, garlic and optional peperoncino. 3. When the onions show signs of transparency and the garlic softens add the cup of chicken stock. 5. Add the chopped Swiss Chard, mix well and cover the pot. 6. Mix often and when it has reduced add some lemon juice. 7. 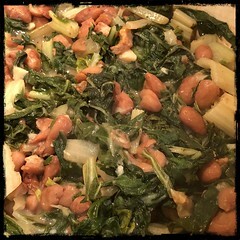 As the Chard shrinks fold in the beans, Let cook and cook for about 10-15 minutes allowing the liquid to be reduced to your liking. 8. Serve with brown rice, potatoes or pasta.